Windows 8 Underscan / Overscan & HDMI Resolution Problem Solved! I had a problem with Windows 8 having underscan (& overscan) issue where the screen was not filling entire TV screen over a HDMI connection, resulting in abnormally large black borders. Who wants to watch 1920x1080 (1080p) HD video content with black borders? Well, after some extensive researching I was able to resolve the issue. The specific computer I'm using is a Dell Zino HD with a ATI / AMD 4330 video card, which was running Windows 7, but I upgraded to Windows 8 and which was when the problems began. On Windows 7, you simply install AMD/ATI's Catalyst Control Center (CCC) and then you can launch CCC and change the underscan/overscan settings to fill your whole screen. 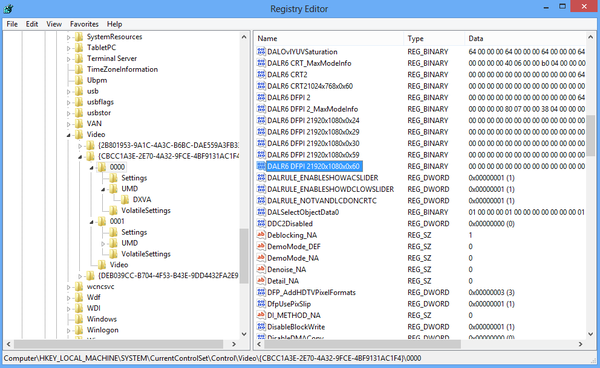 Unfortunately, AMD video driver support for legacy video products isn't so great, especially for Windows 8. I did find a supposedly compatible Windows 8 driver and it installed, but launching CCC did nothing. Back to the drawing board. Select the 0000 folder and search for your TV's resolution. In my case it was 1920×1080 listed as DALR6 DFPI 21920x1080x0x60. You may see a similar key in the 0001 folder, which you may also need to change, but I did not have to. Change your monitor resolution to any other setting & then change it back to 1920×1080 (or whatever you are using) and the underscan should now be gone! If not optimal (overscan & underscan), just try the steps above again using a different value. Start with modifying the default '08' value. That seems to be the "key" to changing the overscan/underscan. The subkey under 0000 and 0001 was "DALR6 DFPI 21920x1080x0x24" for me, but it will vary for your setup. 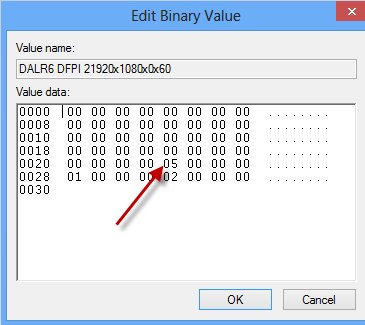 Editing the Binary value for this subkey shows a lot of 00 binary values for my resolution, but the only non-zeroes were 08, 01, and 02. Again, it was changing '08' to '05' that did the trick for me. It's worth a try if my initial technique doesn't work for you. Now, my next problem was the video resolution kept resetting to a lower resolution (1026x768) whenever I rebooted. Very annoying to have to change it back, especially since the Zino is my Home Theater PC (HTPC), so I have to get up and walk up to the wireless keyboard & mouse that I typically have sitting just below the TV. I tried doing a monitor EDID override, thinking perhaps the handshaking between the Denon AVR890 receiver and the Dell Zino AMD 4330 video card was the issue. I tried 'forcing' 1920x1080 to no avail. So instead, I went old school and used 12noon's resolution changer utility to change it automatically at startup. All I had to do was add this bolded command below to the Startup folder (i.e. C:\Users\All Users\Application Data\Microsoft\Windows\Start Menu\Programs\Startup). You can also stick this into the 'Run' key in the Registry, which is where I eventually put this command. Problem solved! Now granted, the resolution goes from 1920x1080 to 1024x768 (HDMI EDID handshake issue?) back to 1920x1080 (via dc64.exe command), but at least I don't have to get up off the couch and manually change the resolution myself. It&apos;s the Tablet Size Niches!